Perfect for groups up to 6 looking for a luxury camping experience. This vehicle is from a private owner. Whether you like touring the wilderness, relaxing at the park, or exploring museums, Arkansas is a great destination. People tour around this state every year to take in all it has to offer. Residents and visitors alike can improve their trip with a quality RV rental in Arkansas. When you’re planning on touring the rural or urban areas in this state and want to do so in comfort, choose Campanda. Our affordable selections come equipped with the features you need to make your next journey a memorable one. The travel industry is one many people have worked with in the past. However, even if you’ve booked a recreational vehicle in the past, it can still be hard to find exactly what you want unless you work with the right company. Campanda is well-known among travelers across the country for our impressive inventory and user-friendly processes. Not only do we give you a choice of over 26,000 RV rentals in Arkansas, we make it quick and easy to request the vehicle you want and book it without problems. Our system lets customers request a rental with no specifics concerning date or brand. You can narrow your search by requesting a model in a specific price range and with the features you’ll need for your trip. RV rental in Arkansas is made easy when you work with the company that cares. Not only do we have the best vehicles for trips, we strive to make the renting process easy. If you’re looking to rent an RV in Arkansas, you know all about the type of investment you’re making. For big decisions like this, people like to be certain about exactly what they’re getting with both the vehicle’s features and the terms of the rental agreement. Campanda doesn’t just offer an impressive selection and affordable prices – we also provide top-notch customer support. We know you want the best result when it comes to renting an RV in Arkansas. Our talented staff understand everything from the products we offer to the booking procedure itself. This allows us to help you more efficiently, and takes much of the stress from the process of renting a recreational vehicle. Campanda’s booking process and support personnel have helped travelers across the country, and we’re ready to assist you. Whether you’re the type of person who likes to plan trips well in advance or someone who likes to hit the road on the spur-of-the-moment, let us help you get in a quality vehicle. Everyone has a different preference for their travel destination. Some people prefer the great outdoors and the tranquil environment of the wilderness and forested areas. Others prefer the fast-paced excitement found in the big cities and all the attractions within. Arkansas is the type of state that offers both, making it a great trip-destination for travelers from all walks of life. From events like festivals and family outings held throughout the year to specific destinations like Hot Springs National Park, there is plenty to see and do in Arkansas. If you’re getting a trailer rental in Arkansas, you can pull up to the designated grounds around outdoor facilities like Crater of Diamonds State Park. You can also tour around the state and visit famous locations like the Arkansas Arts Center and Arkansas Inland Maritime Museum. No matter what types of things you’re interested in, Arkansas provides you with a wide variety of attractions and sites to enjoy. When you’re planning out a trip, consider the types of amenities you’ll need to get the full experience. Everyone’s preference is different when it comes to the type of RV rental they’re looking for. From largescale Class A RVs equipped with a wide variety of luxuries to their slightly smaller and more affordable Class B&C counterparts, Campanda offers something for travelers with all types of needs and all types of budgets. If you’re considering taking your bike on a trail in Arkansas, make sure you choose a model with a rack. You can also get hitches to haul trailers and carts along with you on your trip. Cooking and Dining: From stoves to microwaves to refrigerators, our RVs have what you need to enjoy great food without having to locate a restaurant. You can cook, store, and eat food on the road without worry. Entertainment: On those long trips, having a TV, DVD player, and CD player in the vehicle can make a big difference. Amenities like these are great for making sure passengers don’t get restless on a long trip. Comfort and Leisure: Whether you’re looking for air conditioning, full bathrooms, or both, Campanda’s selection of vehicles are fully equipped to provide you with a luxurious ride. From camper rental to trailer rental to Class A RV rental in Arkansas, you can get a booking with the right features for your destination when you work with Campanda. Don’t settle for less on your next adventure – get a high-quality rental compatible with your budget and take advantage of all the perks offered by Campanda. Campanda has become a leader in the RV industry by combining great vehicles with a simplified booking process. Travelers usually dread the process of trying to find an RV and book it, but Campanda makes things easy. Our support staff and rental request options allow you to avoid the headache and save your time and energy for your trip rather than the RV booking process. 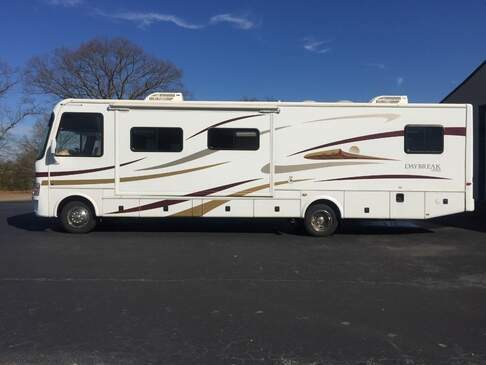 When you’re looking to rent an RV in Arkansas, you should be able to get the best option for your money. You’ll save time and get exactly what you need in a recreational vehicle by working with an industry-expert like Campanda. To find out more about getting an RV rental in Arkansas, contact Campanda today!